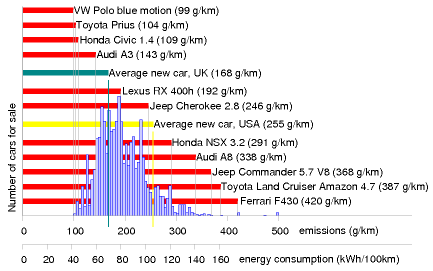 per 100 km, or a Honda NSX 3.2 that uses 116 kWh per 100 km (figure 20.9). Figure 20.9. Carbon pollution, in grams CO2 per km, of a selection of cars for sale in the UK. The horizontal axis shows the emission rate, and the height of the blue histogram indicates the number of models on sale with those emissions in 2006. Source: www.newcarnet.co.uk. The second horizontal scale indicates approximate energy consumptions, assuming that 240 g CO2 is associated with 1 kWh of chemical energy. Figure 20.10. Special parking privileges for electric cars in Ann Arbor, Michigan. Figure 20.11. Monstercars are just tall enough to completely obscure the view and the visibility of pedestrians.